The next kid to say ‘What a cute puppy’ is dead. Eitherway we will think on a title that will be funny and smart. Thanks for looking at my Builds. Last edited by LeopoldKain on Sat Sep 20, 2008 1:12 am, edited 4 times in total. I like the latest version of The Wolf. Why would he ever use that gun when his claws can rip through pretty much anything on the planet? Robbing Banks? 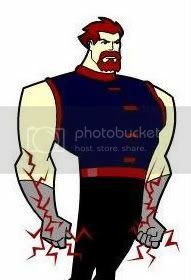 Thunderstrike wrote: I like the latest version of The Wolf. I'm not sure I'm deciphering your combat line correctly. Are you adding Str bonus to melee attack bonus and Dex bonus to ranged attack bonus and defense? Unlike d20, M&M does not add those bonuses to attack. Alan Klett, for instance, looks to be over his PL of 11 even without those bonuses. Taliesin wrote: I'm not sure I'm deciphering your combat line correctly. Are you adding Str bonus to melee attack bonus and Dex bonus to ranged attack bonus and defense? Unlike d20, M&M does not add those bonuses to attack. Alan Klett, for instance, looks to be over his PL of 11 even without those bonuses. You gave him Attack Focus [Melee] 5, which makes his Melee bonus +10. Then it looks like you have Dodge Focus 2, added to base defense +5, so defense should be 17 (13 flat-footed) or +7 (+3 flat-footed). No Dex bonus to defense, either. Toughness should be +8 (+6 flat-footed), +6 from Con and +2 from Defense Roll. Strike Mighty 5pp should only be a Strike 4, but it looks like you gave him 5 (Claw Strike +14 total). PL and pp are not related for NPCs; they can have as many pp as the GM wants, and the PL is simply assigned to describe his challenge level. For PCs, well, the PL and pp are generally prescribed by the GM. This character has attack +10 melee and damage +14 (Strike). Also note that Rage and Sneak Attack are PL-capped. You gave him 2 ranks of Rage, which could be a +4 Str, -2 Def, +3 Fort/Will etc. bonus for 10 rounds or a +6 Str, +3 Fort/Will bonus for 5 rounds. This makes him at least PL14, which is over the limit if you're putting him in a PL11 campaign. That evil look begs the question: are you saying she can't cook? #1 that is a slick piece of art!! If it's ok I may have to "borrow" it for something I was working on for a future game. #2 That One Shot looks like a huge amount of fun to do! Taliesin wrote: You gave him Attack Focus [Melee] 5, which makes his Melee bonus +10. Then it looks like you have Dodge Focus 2, added to base defense +5, so defense should be 17 (13 flat-footed) or +7 (+3 flat-footed). No Dex bonus to defense, either. Toughness should be +8 (+6 flat-footed), +6 from Con and +2 from Defense Roll. I applied what you said... Thank you for the help it means alot... I do mean alot. On the power lvl maybe I should pop him up to lvl 14... I am thinking that this one shot is after we finished up the HFH camapign and by the end he should be reaching PL 14. Taliesin wrote: That evil look begs the question: are you saying she can't cook? Tattooedman wrote: #1 that is a slick piece of art!! If it's ok I may have to "borrow" it for something I was working on for a future game. Say hello to my boom sticks. 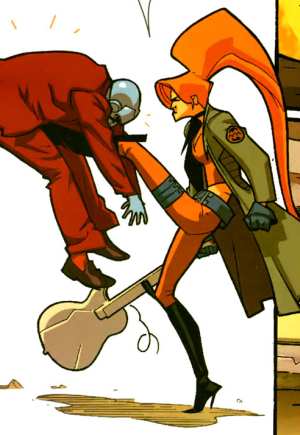 Beautiful and feisty Elsa Bloodstone is the daughter of famous monster hunter Ulysses Bloodstone. Following her parents' breakup when she was two years old, Elsa accompanied her mother across Europe. Despite never knowing her father, Elsa remained curious about him. Though ignorant of her father's career, she was plagued by dreams about vampires and other creatures of the night. Shortly after Elsa's 18th birthday, Ulysses died and left his Boston home (the Bloodstone House) to Elsa and her pregnant mother, along with all of its contents, accumulated during his millennia of adventures. Arriving in Boston, Elsa encountered several unique individuals affiliated with her father: Charles Barnabus, a pureblood vampire lawyer and executor of the estate; the clerk Mr. Dluga, his teenage son Tomas and his vampire-hating grandfather Papa Dluga; and Adam, the caretaker of the house. Actually Frankenstein's Monster, Adam helped indoctrinate Elsa into her true heritage, offering her the mystic Bloodstone Choker which bonded with and empowered Elsa. Adam also gave her other items from her father's collection, including a mystic lamp that contained a captured djinn ("genie") and served as an early-warning detection system, glowing whenever a mystical threat was active in the world. Using the lamp, Elsa encountered Dracula in Bosnia and later helped the Living Mummy defeat the resurrected Egyptian necromancer Rakses. Elsa then became embroiled in a Nosferati vampire plot to infect Dracula, Barnabus and other pureblood vampires with a virus, turning them into an eternal source of nourishment for the Nosferati. Elsa confronted Nosferatu himself, her Bloodstone Choker destroying the vampire when he tried to bite her. After those events, Elsa and her mother had elected to remain at Bloodstone House, turning it into a curiosity shop run by her mother while Elsa continues exploring the family vocation of monster hunting in between college classes. Recently Elsa joined up as part of Iron Man and the government's Fifty States Initiative. Elsa has been identified as one of the 142 registered superheroes who appear to have signed the Superhuman Registration Act and become part of the Initiative. Elsa has exhibited superhuman strength, speed, durability and endurance, and a regenerative ability. She appears to possess all of the abilities her father once had. In addition, She has demonstrated immunity to vampire bites (her blood will destroy a vampire if consumed and the original Bloodgem fragment itself is anathema to vampires). 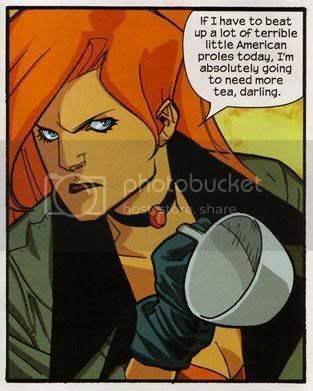 In the Bloodstone series, Elsa claimed that she had inherited at least some of the Bloodgem power genetically, but it has also been shown that her powers of strength and invulnerability were bestowed upon her by the Bloodgem fragment she wears on a choker, although she does not appear to be wearing it in Nextwave #8 flashbacks to her childhood training sessions. She has also been portrayed as an expert marksman. She has been shown to use a removable Bloodgem on a choker as well as a number of artifacts gathered by her father. These include a lamp which contained a genie whom Ulysses had enslaved years ago. This serves as an early warning system, lighting up during times of supernatural crisis, and transporting him to said crisis. 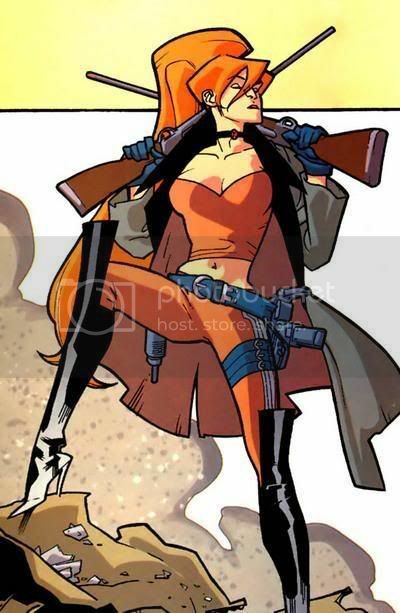 In Nextwave, she carries a guitar case with a false cover, containing two Uzis and a rifle. 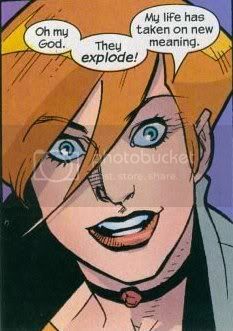 After looking up this person now I want to read Nextwave just to find out everything about her. Last edited by LeopoldKain on Sun Sep 21, 2008 11:01 am, edited 1 time in total. One idea could be to give her blood a holy descriptor and use the Disintegration power for damage. I thought that would work since Disintergtation can effect Fortitude or Toughness. Ahh, the simple pleasures of enjoying your job. I was thinking disintigration as well. I would also make it an aura +1, Range touch -1 and Limited only hurts vampires that bite you -1. Knew I forgot to add something to that. I need to wake up more before I open my mouth here. Thanks for adding the modifiers. 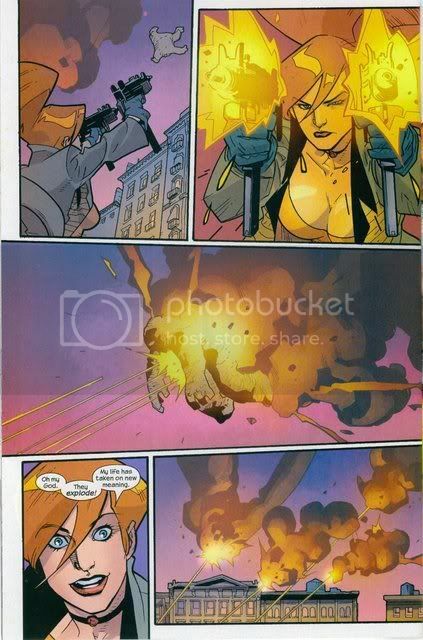 Stuart Immonen does all that, and makes her look hotter than Habanero sauce eye drops. I love that book so much.